It’s early days but I’m really enjoying Neil Finn’s new record Out of Silence, as I did his last, very different, album Dizzy Heights. It was recorded in various sessions put out live on Facebook (the films are all online) but the record stands up on its own beyond the notion of that particular experiment . It’s darker and more sombre than much of his best known output, both in lyrics and in the largely piano and orchestral arrangements. Maybe that’s a function of age – he’s 60 next year – maybe just the subject matter he has taken on, including the Bataclan murders in Terrorise Me. But it’s beautiful in a largely minor key, understated way. I’ve dipped in and out of Crowded House and Finn brothers’ solo material. But the more I listen the more I think that there are very few songwriters since the 60s who can match his unerring ear and ability to write wonderful melodies. The comparison with Paul McCartney has been made so many times it’s become a cliche, but you can see why. He shares with McCartney and a few others like Brian Wilson, Burt Bacharach, Carole King, an apparently effortless ability to write perfect pop songs which for at least a moment just make the world seem a better, more uplifting place. Let’s celebrate the man. Your favourite Finn songs and performances? And if you dissent – as I know some do – let’s hear from you too. From Afterglow. Help is coming. This would probably be a 4 page post if I just went for the the ones I think are fantastic tracks…. Wow that’s interesting. I didn’t know Neil Finn co-wrote. I love that track too. Was spurred into buying the new album yesterday, after hearing a wonderful song from it, Chameleon Days on, of all things Gary Davies’ Radio 2 show yesterday who was standing in for Steve Wright. Gary enthused a lot about the track and went up in my estimation greatly. Below is also Golden Child by Neil Finn group Pajama Club, which am very fond of. ‘Wherever You Are’- lovely, yearning song. Chocolate Cake came up on shuffle tonight. He’s someone whose music I admire more than actually enjoy, but I’m on his side. A few of my favourites, warning one contains a dodgy tache! That Finn brothers one is a cracker. This is from a soundtrack for a New Zealand movie called Rain. And I love this. Walking on the Spot. He’s sheer class.Seen him many times and never disappoints, always willing to experiment, mix things up. Glad to see the Finns getting some attention here on the AW. I hear you cannot go into a supermarket Down Under without hearing their music. I would not complain. This is a real chestnut but it is a lovely song. Finn Fans should know about the tribute albums to their music done by fellow Aussie artists. Wars have been started for less, KFD! They can have Russell Crowe back anytime, though. In the UK imagination, Oz/NZ are next door to each other. Which is fair enough, there’s only 4K miles in it. A mere 1300-1400 miles actually, roughly London-Seville. It’s too bloody far to swim, that’s all I know. Having loved the Conchords, that was a particularly unforgiveable gaffe. On the subject of covers, are there any other covers of songs from the rather fat Finn Songbook? While you think about that, here is an oldie from Tim Finn with a vid that was filmed in Aus.. sorry New Zealand. It’s remakable how well Neil Finn’s voice has held up over the years. He’s almost 60 but his voice is still in wonderful nick. Check out this live performance from about 18 months ago. Or his vocals on this cover version of Bowie’s ‘Moonage Daydream’ from Crowded House’s most recent UK tour. I’m looking forward to listening to the songs on this list, so I’ve made a playlist. Any more Finn faves I should add? Suggestions please! There are many fine covers of Don’t Dream It’s Over. Here it is in Italian, sung by Antonello Venditti. What about Split Enz songs? The only one I really know is Six months in a leaky boat. And that’s because the Wiggles did a cover which I have heard 100 times. What about this one KFD? Always been imoressed by 6 months in a leaky boat – the audacity of the intro – must have had the record label pulling their hair out. Love it. Unavailable on Spotify for some no doubt obscure contractual reason. My favourite Split Enz song is ‘Message to My Girl’ – one of Neil Finn’s finest songs. Here’s a great live version from their 2009 reunion tour of Australia. Not heard that before but it immediately made me think of Squeeze. Way too many to mention, but of his lesser known songs, I’d recommend the album One Nil, which was a successful collaboration with Wendy & Lisa. I would like to have heard much more of that kind of thing. It really showed off his eclectic nature to great effect. Also includes the aforementioned Turn and Run, with Sheryl Crow harmonising. Well worth checking out, again for the broad sweep of styles, is The Sun Came Out, a double album of collaborations with various pals (Jeff Tweedy, various Radioheads). Respect!! I am seriously impressed. You even managed to colour coordinate your shirts in different shades of blue! I had no idea about all those collaborators. I just checked. That double album ( a charity release for Oxfam) is on Spotify. Look for the artist “7 worlds collide” if, like me, you want to give it a listen. Amused to see Rhys Darby there. Surprised he didn’t try to squeeze The Conchords in!! Here is a taste of the album from K T Tunshall. He did an earlier collaboration which also featured members of Radiohead and Johnny Marr, as well as Eddie Vedder. Resulted in a very good live album. One of the highlights was this cover of There Is A Light That Never Goes Out. I think this may have been the first time Johnny Marr played the song since the breakup of the Smiths. My very first concert when I emigrated to NZ in 2001. What a night. Eddie Vedder was a revelation. And I just did the math(s) – on his own he’s personally responsible for the largest number of individual songs that I adore, beating out the entire oeuvres of AC/DC, The Beatles, Del Amitri and Chris Whitley. Not bad going really. Brilliant, Harold. I will add those to the playlist. I may completely off track here but it strikes me that the Finns have been more successful than many of their contemporaries from NZ and Oz. There are several talented bands I can think of, notably The Triffids and the Go Betweens, who followes a similar career trajectory. They went over to Europe, achieved great popularity among a small group of loyal fans but never really reached the commercial success that they were worthy of. 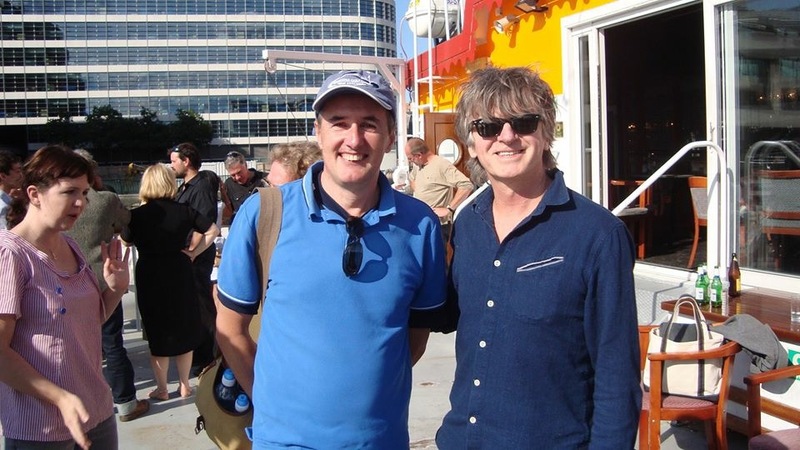 But Neil Finn is still going strong and his songs can be heard in any supermarket from Alice Springs to Adelaide, from Dunedin to Upper Hutt. What is the secret of his success? From the list above, it’s clear he collaborates with some very talented people and takes his songwriting seriously. I’ve seen Crowded House once (with DuCool). A fine show. The support act was Richard Thompson who joined them for the final number and was clearly having a great time. An unlikely combination in my book but a successful one. And here is article about Neil F’s favourite albums. It mentions that this song was directly inspired by Ian McEwan’s Saturday. Because he was in Split Enz and in Crowded House when I discovered them , I presumed that Tim Finn had been a long-term member of the latter. Wrong! He lasted one album and half a tour. But he has worked with many different artists including none other than pianist Sir Les Patterson! It’s a tangent, but have a listen to Before And After by Tum Funn. I am pretty sure you will like it. I love tangents! Keep them coming! IU knew about Split Enz before I heard about Crowded House. Wacky haircuts, bizarre costumes, peculiar songs: my impression of them was that they were like a Kiwi predecessor to the Leningrad Cowboys. What I didn’t realise was that they also had some very fine songs. But they were also very wacky. In a good way. A little band history prior to some songs on the Whistle Test. The first features Neil and I can hear the seeds of Crowded House. Nae dissent fae me. Top man is Nil Fun. A few more Neil Finnish gems that you may not have heard of….. Brother Tim did a rather successful live album with Bic Runga and Dave Dobbyn, who I suspect are a lot better known in NZ than they are on the AW. There was a line in this review of the gig that NF did to launch Dizzy Heights that amused me. Are The Finns a sort of Kiwi First Aid Kit? As a big fan of The Flight of the Conchords, I was fascinated to just discover that it started off as a show in the Edinburgh Fringe and then became a BBC radio programme set in London. What’s more, there is an episode called Neil Finn saves the day and “The Paul McCartney” of North Island” features rather heavily.